She is already hooked, and spent a lot of fun hours going through my scrap bins and practicing sewing straight seams. We went to JoAnn Fabrics on Saturday morning so she could pick out her own fabric to make her first project, a pillowcase. Can you tell what her favorite color is? Have you made one of these scarves before? They're so simple - sewing 2 rectangles, approx. 70-72 inches long together. I started out using AMH's tutorial, but modified the width of my fabric (I made mine a narrower 13.5 in vs. 18 in.) so it wouldn't be so full around the neck, wrapped twice. Please check your email inbox (or a recent comment on your blog WeezyRose!) so we can arrange shipping of your prize. Thanks again to everyone who entered and joined in on the BDSI fun on Twitter. #BDSI: Boxing Day Sew In + GIVEAWAYS! Well the case of household stomach flu on Christmas Eve not withstanding, we had a very nice Christmas yesterday. The girls hit the motherlode with gifts, and the family room looks like a bomb went off in there. I'm ignoring it all in favor of getting some sewing done while the house is quiet today. 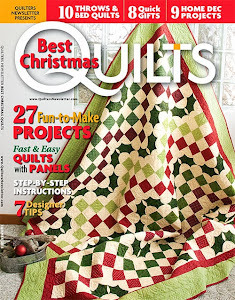 Sandy from the Quilting for the Rest of Us blog and podcast is hosting the (now annual) Boxing Day Sew In (#BDSI on Twitter, Tweetchat, or Instagram). Head on over to her blog for all the details (there aren't many - just join in with your sewing and share over on Twitter) and for the linky party with other blog's who are offering giveaways. OK, I've been talkin' some good stuff on my podcast lately about my hand-dyeing fabric days. Now I'm putting my fabric where my mouth is and GIVING SOME OF MY HAND DYED FABRIC AWAY! So for now, only 2 of you lucky-ducks will pry some of my "preciousness" out of my hands....although I am also using today to clean out/purge my sewing room, so you never know what else I might give up in a moment of madness. reds, greens...don't make me go on or I'll change my mind! So you know in the movie Ghost where Whoopi Goldberg says to Patrick Swayze, "You don't expect me to give this 3 million dollars to a bunch of nuns?!?! ".....LOL, I kind of feel like that except I know that this unused by me fabric for 10+ years will be going to 2 well-loved and deserving homes who will put it to good use....right? So answer this question in the comments below: What kind of sewing project would you use this (or any) hand dyed fabric for? This giveaway is open until Friday, December 27th, at midnight my time (Eastern). Please make sure you are not a no-reply commentor, or leave a valid email address in your comment for me to reach you. If I can't reach you as a winner within 24 hours, a new winner will be chosen. Growing up, my Dad always shopped for Christmas presents on December 24th. Yep, he was a proud "last minute shopper" and he relished in the idea that his best gift "ideas" came to him under pressure. Never mind the fact that as a little kid I was dragged along with him from store to store trying to remember "What's Mommy's size again?" and answering cringe-worthy questions like "Do you think she wants a toaster in white or red?" By the time I was a teenager, I would start asking (read:nagging) him to shop for Mom right after Thanksgiving, but inevitably we would end up at the Mall on Christmas Eve, sifting through a thousand size 7/8 slippers, trying to find the last pair of 9/10s, no matter the color. last box off the shelf on Christmas Eve, it's usually damaged by the 2.8 million hands that have touched it since Black Friday) and uninspired (read:crappy) gifts of toasters, blenders, and I think there was even a can opener one year, because we always ended up at the jewelry store. And boy did they see him coming and roll out the welcome mat. The sales staff at a jewelry store probably funds their summer vacations just on the Christmas Eve commissions from the sad sacks who burst through their doors at 6 pm, desperate for something to save "Christmas gift-giving face" with. 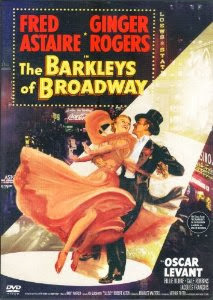 Now, it's not like my Mom wasn't aware how much of a gift-buying procastinator my Dad was (and still is). Like all of us in long-term relationships, you learn a few of the quirks about your partner early on, and you either strive to make adjustments in them (i.e. PUT DOWN THE DAMNED TOILET SEAT OR ELSE!) or you make some adjustments to suit your own purposes. Mom decided to do the latter when it came to Dad's Christmas Eve mad dash. When we walked into that jeweler on Christmas Eve, without fail, the only thing the salesman had to do was present the wrapped box and ask for his credit card. Mom had already "paid me a little visit a few weeks ago Mr. T-----, and she picked out something that suits her beautifully!" Dad didn't even try and put up an argument over the item, price, or presumption of the two of them being in cahoots over her Christmas gift. He may be lousy with the timing, but Dad isn't dumb! My favorite part of the whole thing was how Mom could make the best "oh, you shouldn't have!" and "it's amazing how a 10 cent slice of bread needs a $100 appliance to brown it" faces on Christmas morning. But the funny thing is that over the years, I came to realize that it's something we all just know and love about my Dad. His down-to-the-wire gifts have become a bit of legend in our family; the leaner years where it was can openers and plastic fruit, along with the years he presented us all with Disney World tickets (bought at 9:20 pm 12/24/87. It was stamped on the itinerary LOL) and Mom a brand new car...yep, with a big showroom ribbon on it just like the commercials. 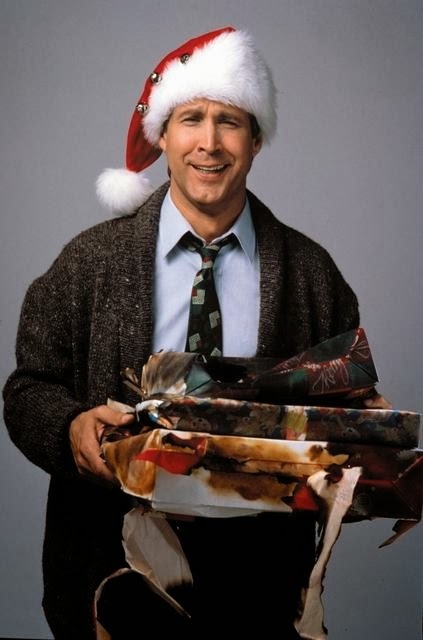 Dad was always so happy giving his gifts, watching us open them, and proudly proclaiming "See, I told you those stores just try and trick you into believing you have to shop early! I got everything yesterday!" Happy Holidays to you all. Hope your gift list is complete...or almost there! Decided to finish the year reading a lot of romance, chick-lit, and light reads. It's been a great reading year, and with the influx of 2014 advances I've received, I am so excited for the New Year! 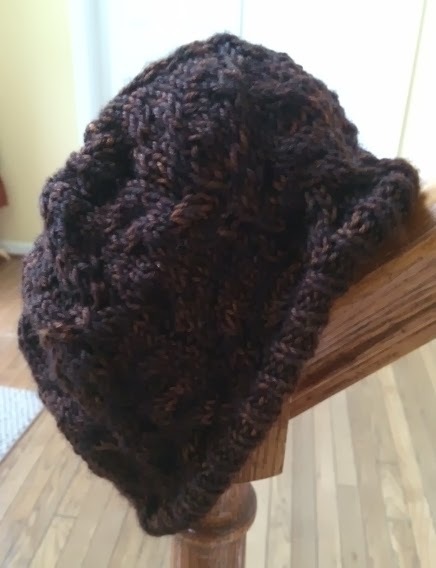 I finished my Forest Floor hat a few weeks ago, and have been so thankful for its coziness with the cold weather in full force. This is a pattern from the book Botanical Knits by Alana Dakos. I knit it using Sanguine Gryphon (now Cephalapod Yarns) yarn in the Traveller base, colorway is Monkeymind. 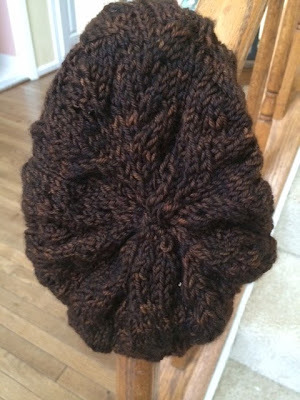 This was a relatively simple hat to knit up, not quite "mindless knitting" as there is a cable pattern in it that varies row-to-row, but definitely doable for an advanced beginner, or if you've never tried knitting cables before. 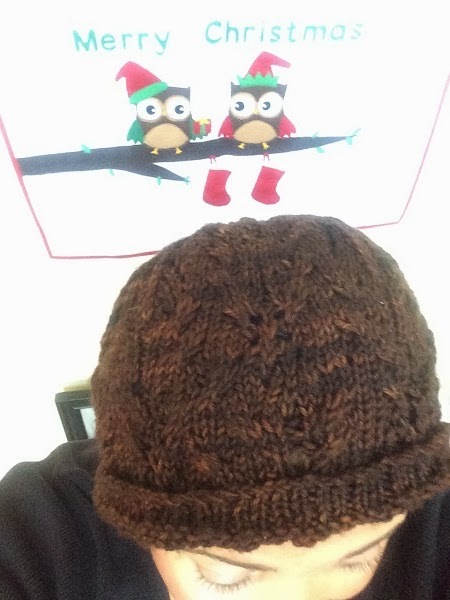 To make this hat you should be able to knit, purl, k2tog, yo, ssk, M1R, M1L, C4F, C4B, and S2KP2. Don't panic, these stitches aren't as complicated as they sound if you're relatively new to knitting! Before this, I'd never done S2KP2, but found a helpful YouTube tutorial here. These are all stitches, including the C4F and C4B which make the cables, that once you see them done 1-2 times, they're very easy to duplicate. I did have a spot of trouble when finishing the hat..I'd never worked on double pointed needles before, and the pattern does start out by saying once you start the decreases for the top of the hat, you should switch from a circular needle to double points (dpns). I tried to go as far as I could using my familiar circs, but alas the stitches got waaaay to tight and difficult to knit, so I switched to dpns, again using a handy video tutorial here. Again, SO simple once you see it done! I don't even know why dpns made me so nervous to use before this...must be all those needles seeming to "go at once" vs. the usual 2 knitting needles you see most often. All in all I'm very happy with my new hat, not just because it's keeping my head warm on the bus stop walks in the morning, but for the new techniques I learned along the way. I'm ready to try another pattern from this book soon, I can't say enough good things about Botanical Knits and how wonderful Alana Dakos's patterns are written - very straightforward and easy to read. She also has a wonderful knitting podcast (audio) by the same name as her blog, Never Not Knitting. It's worth it to give her a listen just for the hilarious theme song sung at the end of the show! I know we're all extra-crazy this time of year. BUT if you still have plans to finish a UFO this month, I'm here to encourage you to get it done!! We've been having fun all year long, getting our UFO's done (although I still have plenty to do in 2014), and I am so happy to see all of the fabulous projects in the Flickr Group. Keep adding yours there to be counted in the prizes I'll be doling out this month. $50 gift certificate to Fat Quarter Shop!!! $25 gift certificate to Fat Quarter Shop! That's $100 in prizes just for finishing a UFO this month! Of course, if you've been playing along all year, you have that many more chances to win. 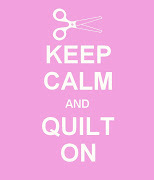 There's still time for us all...pull out those little projects that just need a binding, a button, or to be blocked. Paint that piece of old furniture, finish the last few rows of that sock. YOU CAN DO IT!!! To be counted, all entries must be a finished UFO, listed in the UFO Along Flickr group with at least 1 picture by 11:59 pm 12/31. I will draw prize winners by 1/3/14, announce by 1/5/14. A UFO is any craft project you started in a previous month (not in December, that is a WIP!). Thanks again for playing along. Now FINISH STRONG! !